Brian Bilello has perhaps the hardest job in Major League Soccer right now. 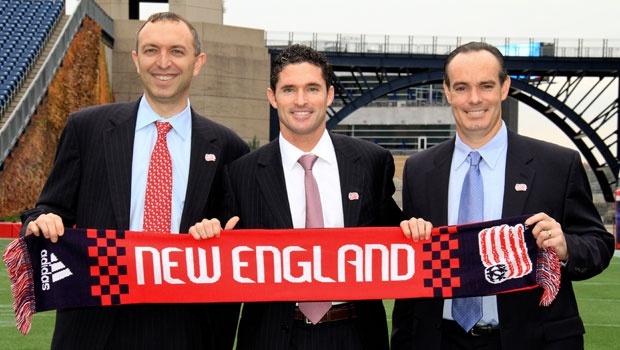 As the President of the New England Revolution, he is facing down issues that many might baulk at. Bilello is tasked with returning the Revolution to the power-house it was during the mid-2000’s and he has dedicated himself to that. He knows that changes must be made, that there are fans to convince and some things simply need an overhaul. What you might not know, is that much of his project is already under way. Promoted from Chief Operations Officer in November of 2011, Bilello is on a mission to see the Revolution back to an organization of respect, dignity and a team to be feared on the field. I was able to catch up with him and talk about a number of these topics. MLS Reserves: Can you start off by letting myself and the fans know what it is specifically that you do for the Revolution? MLS Reserves: You were promoted in November 2011 whereas before you were the clubs Chief Operating Officer. In that role, you and the Revolution were subjected to quite a bit of fan scrutiny. Can you talk a bit about that and how the organization has dealt with it? The Revolution had fantastic success in the early and middle parts of the last decade. The team went to the MLS Cup in 2002, 2005, 2006 and 2007. The team also won the US Open Cup in 2007 and the Superliga in 2008. The team produced league and national teams stars such as Steve Ralston, Taylor Twellman and Clint Dempsey. Needless to say, for a time, the Revolution had an amazing on field product that fans could be proud of. That pride though, has soured in recent years. So much so that fans have become vocal about their frustrations. One incident back in June of 2011 is of note when several supporters were escorted away from the stadium due to swearing and misconduct. The incident caused a bit of a media storm at the time as the language was part of a chant used by fans to discourage the opposing team. For his part, Bilello feels that things like that can be avoided with simple communication. MLS Reserves: One of the things I think has happened in the past few years, is that you’ve had disgruntled fans or groups, and what was not heard, was what the Revolution were doing to fix it. Since taking over, have you noticed a change in the relationship between the fans and the front office? What many fans now may not know is that in the team’s infancy, Bilello himself was a season ticket holder. Note that; he was a fan first, so he understands the challenges that come with supporting a team, particularly one that is having problems. Brian Bilello: “Supporters culture is very important to me and the challenge is just balancing it out. [Fans] are an aspect that I recognize and that I want to help grow. MLS Reserves: The Revolution have been accused of being a cheap team and in my own interview with Jay Heaps, he acknowledged that. But one of the things he made a point of saying, was that the Krafts are really stepping up. In what ways is this happening and how is the organization changing? Mike Burns is the team’s General Manager. He has been with the team eight years, but this is his first as GM. Like Bilello, he was promoted back in November from his previous position, which was Vice President of Player Personnel. Burns was a member the United States national team in both the ’94 and ’98 World Cups. MLS Reserves: Heaps talked about instilling a culture of winning. The reality is, that is just as important on the field as in the front office. Can you talk a bit about how you yourself have changed since November and what you’re doing to see that change happens top to bottom? MLS Reserves: Is there anything happening on that front? It is here that I heard a loud and frustrated sigh from Bilello. If anything, it was evident from his tone of voice that he wants a soccer specific stadium very badly for his team and the fans. Brian Bilello: “No, we’ve been working. I’m hoping in the next 60 days we might be able to talk about that. We feel good about the direction its heading, but we’ve said from the beginning: even if it takes long and costs more money, placing the stadium in the right, urban core is more important than getting it done. MLS Reserves: It seems that many fans feel they have been left to rot and the team has forgotten about them. What is your message to those who may still feel jaded or have been reluctant to return to the team? 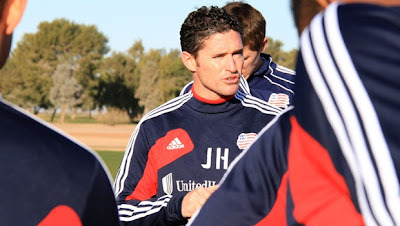 MLS Reserves: Lastly, with the fantastic pre-season behind you, what goals have the Revolution set in the immediate future, for this 2012 season? On the field and off. “Our fans show a lot of loyalty and dedication and our staff works very hard to work for that. I think there is an opportunity to grow our ticket sales and fan base, we have to do that. MLS Reserves: Brian thank you for your time and for your candid responses. It truly does make a difference, so thank you for that. Bilello’s candid and honest approach to many of the tough questions should encourage fans. He knows that there things still in need of changing and made it very clear that the righting the ship that is the Revolution is his mission. He clearly wants to see the organization achieve greatness and that passion should encourage fans of both the team and the league. Bottom line, Bilello’s message is simple: It will be better. The toughest job in MLS? Don't you mean the easiest job? He works for Kraft. They promote failure. Whatta joke this president is. Another BS thrown at NE fans. Hopefully the supporters groups will help out the front office for the battle on getting a soccer stadium. Every proposed-stadium will have an annoying a neighborhood association or councilman that does not want a stadium. Timbers Army did great with their grassroots efforts on getting a stadium. This is from a Sounders supporter. Having been a fan of Soccer since birth..or at least since the first time I saw a pro game, the passion that surrounds an organization cannot be explained, let alone bottled up and spread on potential fans like holy water. Having now been a fan of the Revs since their inception, the ups and downs I've endured BECAUSE of this lack of passion has been the one critical factor that instills the negativity that I possess. My negativity is directly proportional to the amount of Apathy that we've endured at the hand of Kraft. I never expected him to be a Rah Rah type of owner..or have any of the qualities that we now see in Bob Heinman or Merrit Paulson. But, even the slightest interest and mention of the Revs when he's on a Radio show, etc. Would be nice. He can give all the excuses he wants about why he wasn't at MLS CUP 2006..but, in the end, if the REVS had won, HE WOULDN'T have been there..and that to me is a sporting SIN of the highest degree. Or when he says things like.."I'll be watching college football" when a reporter asked him what he was doing one particular week-end. That week-end was actually the final regular season game of the Revs up in Toronto(A city, that's not too far from Boston). Want to know why MY NEGATIVITY won't QUIT, BRIAN??? It will last as long as the Apathy that the Krafts show for this team, league and Sport!! They can promote Brian and Mike to even higher positions next year..and give us the same rhetoric as we've always heard. But, in the end..the ownership Apathy that we've endured for 17 years continues. The Negativity WILL STOP, once I feel that the Kraft Apathy is over..! Back in 2009 on the team's now defunct "Defend The Fort" website, Mr. Bilello told fans the reason playoff attendance was so low is that fans had become "tired" of the team making the playoffs so often. Just so you know who you're dealing with. ... you make it sound like complacency isn't an issue New England fans of any team aren't known for. This interview is the same thing NE fans have been fed for years. "Soccer Specific Stadium news is on the way" and apparently consistently miss out on DP's because they couldn't work out the financials. Interviews like these just boil my blood because I know its just more garbage to string along the last of the STH's that continue to support the team.